A film produced using “found” and “archival” footage. I remixed videos to create new meaning! Sit back, and enjoy “Hypocrite” and learn about the American dream!! The project was produced for a class that uses found footage. Ideas expressed in the video are mine alone. For a complete list of sources, please contact the producer. Sounds familiar? What Shakespeare penned down in ‘As You Like It’ is more than mere words. The monologue captures the essence of international relations since early ages.A ruler plays both protector and destroyer based on what he or she deems appropriate for his/ her strategy to expand his/her empire. Likewise we have witnessed empires rise, rulers claim victory and be favored amid his/her people, and civilizations flourish. But the contrary is also true, empires fall, power is seized and abused, civilizations have collapsed. Throughout history and during different periods Persian, Greek, Roman, British, French, Spanish, Portuguese, and the Ottoman empires were the power feared and respected world over. Each enjoyed a glorious victory over the preceding hegemonic power in a gory blood bath and extended their reign to lands near and far. Eventually however they succumbed to other powers adding more to history. Arguably therefore the more known history is tainted with violence. There are of course subtle nonviolent victories like the ones in South Africa, Burma (under Aung San Suu Kyi), and India, but somehow these take the backseat when relying on precedents to resolve a conflict or protect borders. What has remained common amid the two categories of historical events is the rise and fall of power and powerhouses. Man, thus, cannot be charged with being anarchic in nature, as many theorists have done. Should it be intended for man to heed to violence when dealing with his problems, we would not hear stories of victory achieved on mere perseverance to adhere to peaceful means. We would not have peace and nonviolence activists or NGOs working for sustainable peace. This shows that man switches in and out of roles and acts based on the personal nature of the issue at hand and how they perceive history. The sword in the past, and the gun in today’s age are therefore not mightier than education and the pen. If a country’s people have only known history of oppression, deceit, and dictatorship, they tend to live under that reality unless, of course, someone challenges this reality. Not everyday is such a challenger born. This challenger could be hailed as the leader of the movement that is challenging the norm, or he/she could be the founder of a movement consciously or naively. Did Mohammed Bouazizi know that his expression of rage and discontent would spark revolutions across the Arab world? We can only speculate about the answer, based on what the people of Tunisia know about their past and present i.e. the history of authoritarian rule. Analysts and philosophers like to ponder on the ‘what if’ questions. What if Bouazizi had remained passive and just protested at the local police station verbally? What if his story would have gone unheard? After all, how often do we hear of a small town vegetable vendor who makes history? But history is full of traces of such individuals – common man who senses injustice and decides to speak on behalf of his people. The essential piece of such opposition is that the movements have begun with local individuals in the lead. No outside force could gain control of the movements despite constant and clandestine efforts to do so. The determination of Tunisians led to the ousting of Ben Ali. Mubarak was toppled by the Egyptians themselves. The interference of NATO, an external force to Libya, and now the sanctions on Syria only cause havoc in the respective countries. The latter cases shine the light on how prying by foreign agents can lead to mayhem in a country. Libya saw the end of Ghaddafi, a leader that challenged western hegemony. Assad is trying his utmost to hold on to power perhaps because he fears that his country too would be taken over by western powers. The consequences of foreign intervention are there for us all to see. However, it has been popularly argued that he is merely trying to retain his power presence in Syria. Most leaders are known to have both a favorable and unfavorable side to them. This does not give western powers the right to ransack a country and dictate their mandate to citizens of that country. Yes, Ghaddafi was ruthless, but the world also knows him as an eccentric leader and someone who could not, and had not, caused that much harm to others. He intended to unite Africa toward development and replace the dollar as the global currency. Clearly, the US would not sit still and let that happen. It took its conventional route of violence and armed local rebels without paying heed to what the consequences would be. America does not care about development in some faraway land; but it should because it, too, would not welcome outside interference in its affairs. So why is the US government the first to jump on its toes and play savior? America’s players are replaced every 4 to 8 years and yet it does not re-evaluate its policies. It doesn’t learn. When former US agent Mubarak was being challenged by the people, the American government decided to switch gears and support the call for democracy. Little did they know that this democracy would not be similar or compatible with their definition of democracy! History repeats itself and if you do not learn from it, you are not a superpower but a naïve player. 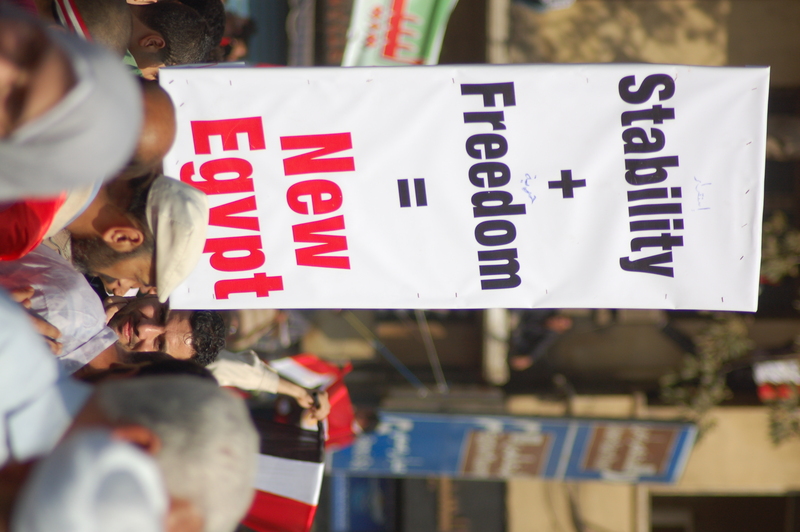 Analysts have compared Egypt to Iran but for the wrong reasons. 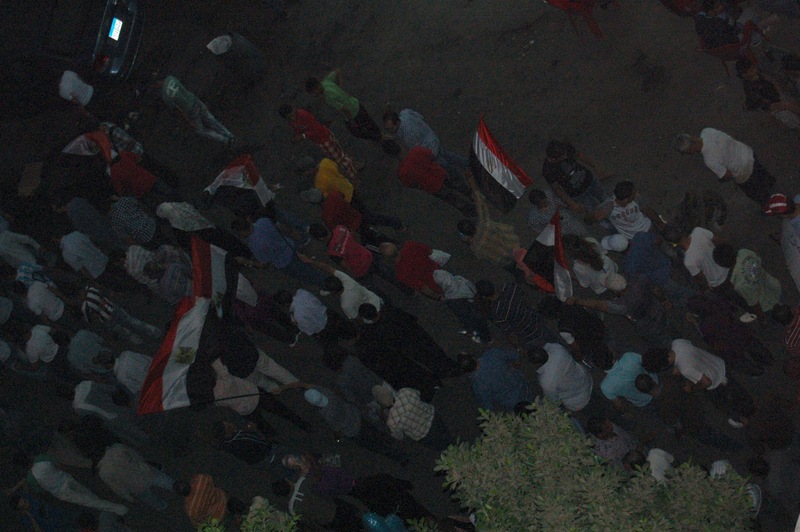 Egypt may never become an Islamic republic. But the US has once again shown how naïve it is. The government of Eisenhower generously supported the Shah until, of course, the Shah began the process of restoring Persia’s glory in the world and in some respects challenging the US. American support of the Shah ceased completely when the Iranian people demanded that he and his westernization policies be replaced by a charismatic cleric Khomeini. This Khomeini was the same man who had previously harshly criticized the US for its masterminding the coup of 1953 against Iran’s democratically elected government, and its constant efforts to dictate how their country should be run. The US somehow decided to ignore the past relationship with the cleric and pledged its support for democratic change in Iran. Its hopes were slashed when, in late 70’s and early 80’s, Khomeini exposed his plan for an Islamic Republic with him as the Supreme Leader and declared Iran as an enemy of the US. Now Iran is part of what George W. Bush termed the Axis of Evil that also includes Iraq and North Korea which have shared a similar questionable relationships with the US. The United States is again facing a situation of a parallel nature in Egypt and other Arab countries. The democratic movement in Egypt is facing criticism from Washington because Egyptians elected the Freedom and Justice Party, the political wing of the Ikhwan Muslemeen (Muslim Brotherhood) a group deemed too radical by western powers. Western powers fail to understand that democracy should be unhindered or else it is anything but democracy. Islam and sharia, if adopted in tolerant doses, are not toxic to global security. Many on the Egyptian streets believe that not much has changed, but they take pride in the fact that they were able to break free from the only system they had ever known. The US instead ought to congratulate them as they write their future themselves. Or, it should keep out completely. The consequences of American and western interference at large is not a clandestine affair. The US government supported Libya while it felt Libya was in line with their plans for the region and withdrew support when their former ally challenged western intentions. By supporting the rebels last year with arms – which was beyond any doubt against the UN Security Council mandate for Libya (Resolution 1975) – they have, once again, dug themselves into a deep hole. They managed to get rid of Ghaddafi in a brutal display of victory but, like in Iraq, did not have the faintest idea about what should come after his death. Except getting access to the oil, of course. Despite having been the wealthiest country in Africa under Ghaddafi, Libya is now in a sorry state of affairs and there seems no solution in sight. The lack of institutions and a history of dependence on their leader is a disabling factor, and Libyans have a long way to go before they can take charge of their own land. Supporters of the former regime have nowhere to go. They are constantly targeted and their human rights violated. Even criminals have rights in the United States. Is it a crime to pledge support for a ideal and to fight for it? In the best of cases, the US can provide educational and institutional support for Libyans to heal from a brutal war. Military equipment and agents on the ground is not the type of support the majority of Libyans would like the west to provide to their country. In all of this Washington must stay alert because it has a precedence: it’s experience with the Mujahedeen in Afghanistan. The arms and ammunition supplied to the Libyan rebels could very well be targeted toward the US and its allies and interests if the Libyans become discontent with the way the US continues to interfere in the Arab world. Providing arms is a risky affair and no one is immune from the damage it can potentially cause. This vicious cycle of chameleon-like coming and going on a stage Shakespeare-style is but a part of global politics. The world is truly a stage and man is merely an actor. But even actors improvise, confront their fears about acting, and are eventually replaced by fresh talent as time goes by. No one can monopolize the stage forever unless, of course, the drama is actually a monologue. The real world outside the theatre – sadly for the monopolizing, imperial powers, but happily for the rest – is not. The members of the Green revolution and young Iranians should be made aware of what is known to the the new generation of Arabs who like their Iranian peers took to the streets to demand a new future for their country earlier this year and through today. The are convinced that the US is responsible for the mess that is hindering peace during the most crucial times. It is also widely accepted in the region that the US will go great lengths in ensuring the existence of Israel, a country that they believe has doomed the region by its cunning and devious plans. If the Arabs are weary, Iranians too must be cautious. America fears that an Islamic government in Egypt would destabilize peace with Israel. There are rumors that the US is clandestinely encouraging violent clashes that have ravaged Cairo for the past couple of weeks. They have also been trying tirelessly to block Iran’s nuclear capability for this very reason. Based on what the region has witnessed since the beginning of this year, it wouldn’t be inappropriate to determine that Egypt and Libya are under occupation. Every developing country that has ever tried to advance and help others advance has fallen. This was known as ‘colonization’, today it is referred to as ‘occupation’. We have seen this happen time and again in history. It is strange then that people have yet to learn to rely on themselves and on their resources. The question that perplexes political analysts is why people continue to ask assistance of those that have a long history of betrayal? In fact, the very reason America is entrusted power should be questioned. It is not enough to respond by saying that America deserves to protect itself and its interests. Does this interest then justify what the US military did to Iraq, and Afghanistan, and what the government in the guise of NATO is currently doing to Libyans? And if it is, why then aren’t Al-Qaeda or other groups that defend their faith, country, and traditions? All have killed innocent people, and sure enough if one is a defender, the others should be as well. The word hypocrisy bears to mind! The world knows this and yet those who can make a difference- common Americans, remain silent.There are a few activists and groups raising hell now and again, but this is not enough for the scope of the problem. Americans have tremendous power, simply by the way their government is organized and they must be reminded that silence is often translated as compliance. The noteworthy Occupy movement of America is a good reference point and can be influential in how the US government runs its foreign policy as well. The movement would need to expand its agenda and strive to involve people from all social and economic classes. Americans are able to cease all the injustice that their government is engaged in simply by way of refusing to pay taxes. If the influx of tax dollars is severed, the US armed forces will be paralyzed and they would be constrained to choose their battles and moves wisely, instead of simply impairing countries and leaders under the pretext of protecting their power position. For one thing, their power is slipping and their desperation to hold on, is becoming obvious. This, the American people should realize, before their government continues to compromise their security. And for this too we have history to turn to. Beginning the first quarter of the 19th century Indians engaged in civil disobedience against the British. Workers quit showing up for work in mills and consumers shifted to Indian-produced products. These simple acts led to an independent country in 1947, albeit the bloody partition of the country into modern-day India and Pakistan. India’s Gandhi, leader of the non-violent movement is revered all over the world. Why then do we see such few Gandhis today? Ahmed and Hamza are two of millions of Arabs who are willing to face American bullets as they defend their land from intruders. There will be justice and peace they say, but it will be on their accord. The general consensus in the region since the revolution in Tunisia changed the region is that no military government or American puppets will govern them. The harder America tries to hold on as a result, the easier it will be for the Islamic government to prevail. America must therefore be weary of inciting further instability as the Arabs warn that the consequences can be grave. Who can blame them though? When Al Qaeda successfully carried out the 9/11 attacks, America headed to avenge the act. Do policy makers in Washington think, that the Arabs will sit still and let Pentagon destroy their hope for a future? Power players are not naive. The young Iranians therefore should be weary of whom they are channeling their SOS toward. They must need reminding of their history, which is tainted with American infamy. Perhaps, they need to be informed that it was the US that supported the Shah until they realized he wouldn’t serve as their puppet, before they endorsed Khomeini, the very man the youth of Iran detest.